Characteristics: Long slim bodies. Pinchers or “cerci” on the back of their abdomen. 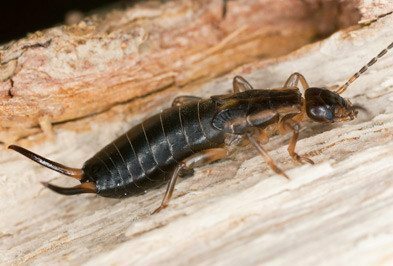 Earwigs are brown to reddish-brown in color, they have a long slim body with distinctive pinchers or “cerci” that are found on the back of their abdomen. Adult can grow to be 5/8th of an inch in length although some species can grow up to an inch in length. Earwigs can be winged or not depending on the species. Are earwigs dangerous to people? There’s a myth associated with earwigs that they crawl into brains and lay eggs. Thankfully this is completely untrue. Really, there is nothing dangerous about earwigs. Even their pincher-like appendages are not used against people. Earwigs are primarily nuisance pest, both inside and out. Will earwigs damage my garden? Yes, some species of earwigs will cause damage to gardens. They will feed on the shoots of young seedlings, damaging the plant so that it will not be able to yield a crop. Why do I have an earwig problem inside? Earwigs are attracted to outdoor lighting and often enter homes through cracks in the foundation and underneath doors. This is often by accident when they are searching for food. They may also migrate inside when the weather become too hot or too dry. Earwigs favor damp, dark places. You may also find earwigs inside because they were on the newspaper that the paperboy threw on the lawn, on packages the deliveryman left on your step and on potted plants that had been set outside. Your houseplants might be in danger if earwigs have infested the house. They will not consume entire houseplants but will feed on decaying organic material found in the soil and may eventually damage the roots of plants, especially young ones. How do I control earwigs? At Holder’s Pest Solutions, we offer home pest control services that target earwigs and other occasional invaders as well as many other common household pests. Our EnviroGuard program includes year round service, six scheduled visits and works by establishing an exterior barrier to keep pests out. When you choose this program, you can count on us to keep your home pest free. Should you notice a pest problem between visits, we’ll come back out and treat for no additional charge. How do I keep earwigs out of my house? Like many other pests, earwigs like moisture. Reduce humidity levels in and around your home, make sure that any outdoor leaky fixtures are repaired, that gutters are directing water away from your home, and use de-humidifiers within your home. Caulk gaps found around windows and doors and install door sweeps. It can also help to swap out white outdoor lighting with yellow lights that deter insect activity.